The River Ribble flows from Yorkshire via Settle, through Clitheroe and Preston in Lancashire and out into the Irish Sea between Lytham St Annes and Southport, a total length of 75 miles. It is tidal for 11 miles up to Preston and the estuary is 10 miles wide. 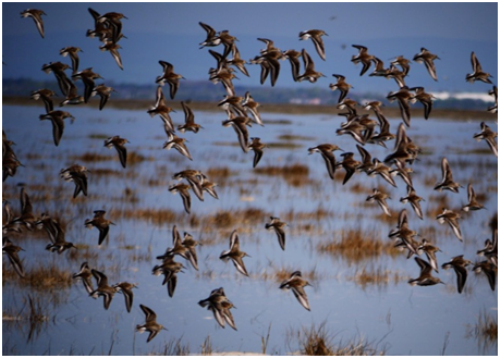 Up to 340,000 water birds over-winter on the Ribble estuary making it the most important wetland site in the UK. In the 1960’s the last new sea bank was built north of Southport using household rubbish for the core of the bank and later the coastal road was built on top. Finished in 1976 it enclosed a large area of salt marsh which later became fresh water marsh. In 1994 the RSPB leased the marsh from Sefton Council and the RSPB Marshside Nature Reserve was created. The reserve is now part of the Ribble Coast and Wetlands Regional Park, and is recognised as internationally important for several species of waterfowl. Outside of the coastal road the huge expanses of the salt-marshes extend for many miles as they do on the northern bank near Lytham. Large areas are farmed, much is managed by Natural England and the RSPB for the benefit of the wildlife and a large network of footpaths gives access for the public to enjoy the birds, hares, butterflies and flowers. But it is the huge flocks of water-birds, both on the marsh and along the shore-line, that gives the greatest spectacle. Literally thousands of geese, ducks and waders flying over the wide sandy beaches, across the salt marshes, ignoring the cars along the coast road and down onto the scrapes, tussocks and pools. The high spring tides provide watchers with the opportunity to get very close to these huge flocks and marvel at the speed and agility of the birds as they wheel and swoop along the tide line. Occasionally more solitary birds arrive, the Short-eared Owls, Marsh Harriers and Peregrines hunting over these rich lands and thrilling those who take the opportunity these high tides provide. The area is rich in migratory species too and rewards those who get up early, ignore the variable weather and put in the hours of patient watching. 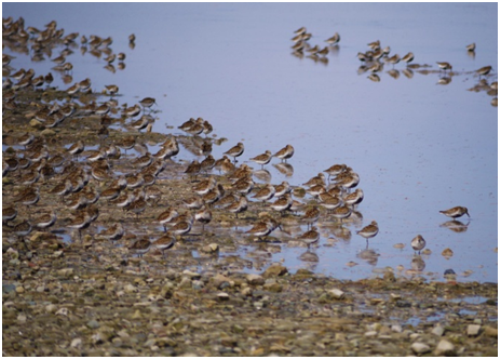 The Ribble marshes provide a magnificent opportunity for people to watch birds in a huge, wild setting that is readily accessible for people and a vital environment for the resident wildlife and all those that over-winter here or just pass through. This entry was posted in Birds, Places on May 14, 2012 by Paul Scraton. How wonderful to see this! I lived in Southport as a teenager but moved away before the RSPB reserve came into being unfortunately. We had a house on the south side of town with the old disused railway line at the bottom, and the dunes beyond. They built the coastal road on it before I left which changed things, I thought for the worse. I guess the reserve was a worthwhile benefit though in the end. I am now an RSPB member but I wasn’t so interested when I was younger. Stunning photos. Makes me keen to get back to teh Ribble Estuary to see Marshside and the coastal areas, and to visit the more recent sites and facilities in the area. Nice one Chris.